The Dish: The second dish we tried at a recent visit to Johannes restaurant in Palm Springs CA was one of the nightly specials: the Hungarian-style goulash. I’ve been to Budapest and have sampled some classic and wonderful goulashes there, but again, Johannes stands out with a superior interpretation of a Continental classic. The goulash has a generous paprika flavor, more striking than most goulashes, and the bright peppery gravy lingered in the mouth as the slow-braised meat was devoured. The quality of the meat makes the Johannes Hungarian goulash a star. 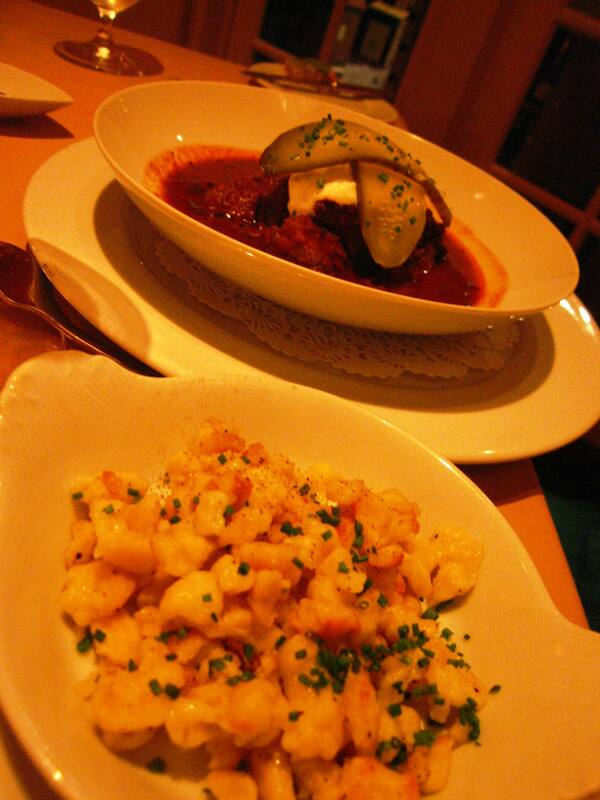 The goulash is topped with a cruciform of pickle, a cap of sour cream of course, and comes with a nice big side dish of spaetzle. Highly recommended when it returns to the menu. It’s not every day that someone this side of Sydney gets to dine upon kangaroo loin, so that’s what I ordered at Johannes in Palm Springs, CA. And it was excellent. The Vibe: Understated décor, with comfy, white, high-back chairs, and a few cool paintings on the cool cantaloupe walls that reminded us of a couple of European cities. The Dish: Australian, Grass-fed Kangaroo Loin. Wow; what a phenomenal dish from Johannes’ April menu. 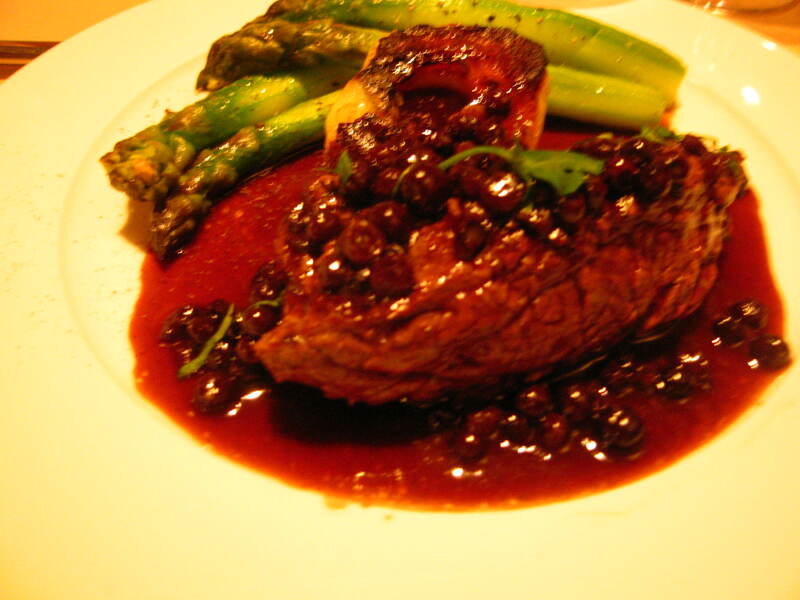 This goes on my list of favorite meaty dishes for 2008. It’s a clear indication of their commitment to excellent food. The perfect loin was drizzled with an “organic wild blueberry port essence” that was rich but not heavy. For those who have not enjoyed kangaroo meat, it’s wonderfully lean, with a mild flavor and a texture between steak and (closer to) lamb. The kangaroo loin at Johannes was thick and lean, perfectly medium-rare, and tastier than any steak I’ve had in the past few years. The Damage: The kangaroo loin is $28. Accompanied by large, tenderly grilled summer asparagus and a glazed Granny Smith apple, it’s a hearty, fantastic plate and a good value for the price. Being one of the best meat dishes I’ve enjoyed in the past couple of years, the only real damage is the inability to eat this more often. The Word: Don’t be fooled by OpenTable’s “top 10 booked restaurants” in Palm Springs, because people going to Palm Springs are not renowned for good taste. OpenTables’s Top 10 for Palm Springs always includes chain restaurants, and overrated Palm Springs steakhouses living on dusty reputations. For my money, the best restaurant (at least the best I’ve been to thus far) in Palm Springs in Johannes. Among the half dozen restaurants we sampled during a recent trip to Palm Springs and Desert Hot Springs, no other restaurant came close to its exceptional food and service. Owner-chef Johannes Bacher injects California freshness into a strong sampling of Continental fare from his native Austria and beyond. The meaty classics here include roasted duck breast, young lamb rack, pork loin, tenderloin steak, and a lauded version of wiener schnitzel. For non-carnivores, Johannes has great seafood dishes as well. The Vibe: Clean, fairly minimal setting, with simple, high-backed white chairs and crisp white tablecloths. A few tasteful paintings (European landscapes, perhaps) decorate the main room, whose walls are painted a cooling, canteloupe color. The wine cellar has a see-through door that revealed messy stacks of wine boxes piled in among the neatly stacked bottles in the walls, but it was a tiny detriment. The Service: The service was truly excellent: attentive and warm but non-intrusive. I give an extra commendation because we called to say we were running late (very close to the time of closing). The hostess was relaxed and encouraged us to get there whenever we could instead of the usual restaurant response (grief and consternation). When we arrived much earlier than we expected, she welcomed us and said it would have been OK if we would have been late. That is a rare gem of service in the restaurant business, so kudos to Johannes.